This is a MUST-HAVE product when TRAVELLING! * If you want to go abroad, it can cover 160 countries with US/EU/UK/AUS plugs. You don’t need to carry a lot of chargers in your luggage. 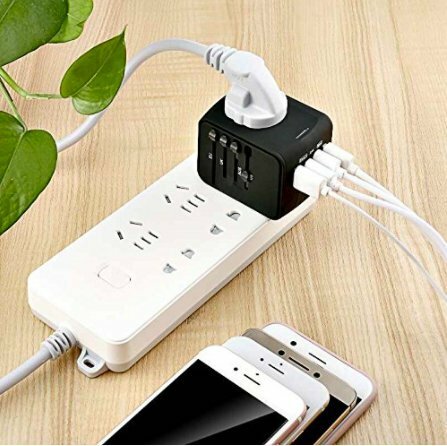 * Perfect for home, if you have one or more products to charge. 5 devices can be charged at the same time so no more need to search outlets everywhere. * The built-in fuse will cut off automatically once the temperature is too high or current overload in order to protect your electronic products. Once the original fuse burned out, dig out the Fuse Button and change to a new fuse. 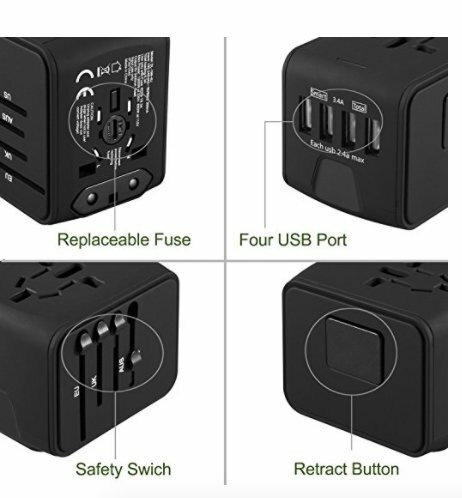 * Press the prongs accordingly to get the local plug you need, then connect your device with this universal adapter. * Upon getting the power, the LED light will indicates the working status of your smart phone or other digital products. * This travel plug charger adapter is not a power converter and does not convert voltage. 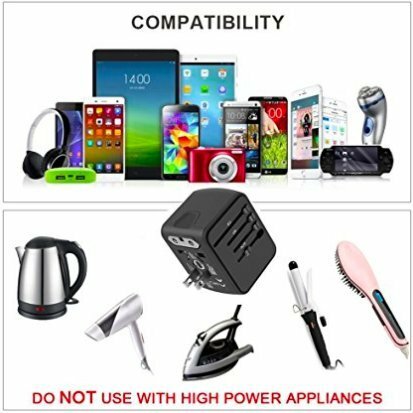 * Please check appropriate device voltage before using this adapter. It is not suited for high-powered electrical appliances. * Eg: 110V devices can’t be used in 220V or other higher voltage countries with this charger. 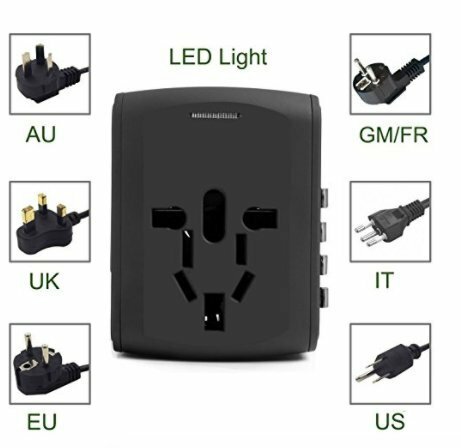 * Each country has its own regulations regarding the use of travel adapter; please check in each country carefully. TAKE ADVANTAGE OF THIS DEAL! 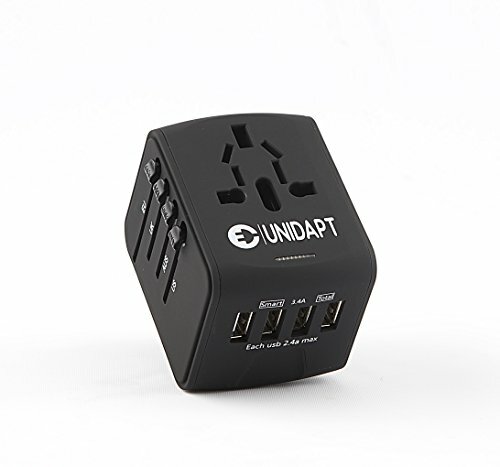 SUPPLY IS LIMITED, CLICK ADD TO CART AND GET READY TO TRAVEL!★ TRAVEL ESSENTIAL: Use Unidapts small International Power Adapter and BE sure that wherever you travel, you can keep your devices fully CHARGED! Intelligent charge “IC” allows it to automatically recognise devices and delivers the best electric current for everything you plug in, for optimised charging time of all of your devices. 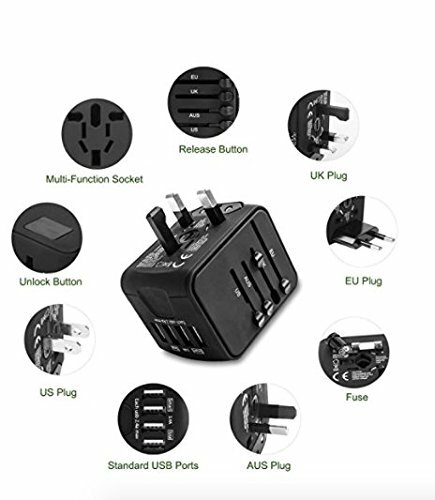 ★ SIMULTANEOUSLY CHARGE UP TO 5 DEVICES: Adaptor allows SIMULTANEOUS use of the AC Power Socket and Four SMART USB CHARGING Ports including smart phone (IOS and Android), portable Bluetooth speakers, power banks, tablets and so on. 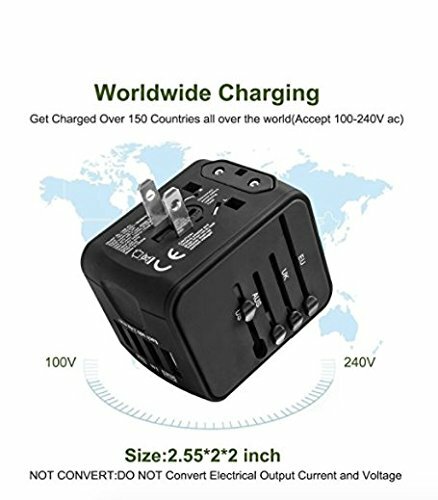 ★ EXPERIENCE WORLDWIDE USAGE: Covering over 160 countries with US/UK/EU/AU plugs, The Portable Converter support outlets in North America, United Kingdom, Continental European, Australia, Germany, Japan, Iceland, India, Ireland, Sweden,Thailand, South Korea, China and so on. ★ POWER & SAFETY: 4 AC wall power sockets- 6 Amp max (660W max. at 110V, 1380W max. at 230V), AC 100-240V-max 6A output; 4-Port USB charger 2.4A 5V DC max; 2400mA 5. Made of the best fire resistant PC shell, including safety shutters for AC sockets, Dual Safety Fuse and a current stabiliser. CERTIFICATIONS ROHS, CE and FC which gives you great overall protection. ★ SATISFACTION GUARANTEE: 30-Day Money-Back Guarantee and 1-Year Limited Warranty. Feel free to contact us if you have any questions.We will offer you satisfactory solution and we will reply you within 24 hours. NOTE: Adapter only converts the power, does not convert voltage AC. Not suitable for high powered electrical appliances that requires over 1200 watts.